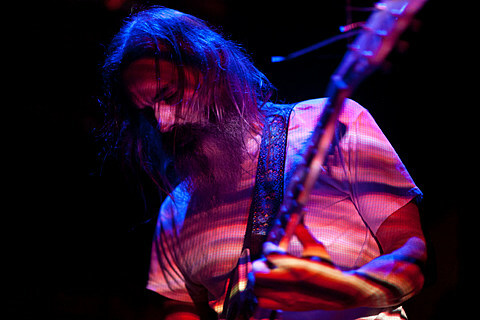 As mentioned, Moon Duo will be back this spring with new album Shadows of the Sun. The band made the record in their new home base of Portland, OR and it’s another fine addition to their canon of pop-n-drone releases. You can check out first single “Animal” if you haven’t already. Before we get to next year, Moon Duo sent us their list of 10 favorite things from 2014. Most are music-related, but there’s art and legislation in there too, with commentary as well. Still the best. Perfect way to start the year. Played loud enough through broken speakers and it’s almost like being at a Hookworms show. Good ol’ rock ‘n’ roll. Bleeps, bloops, static and hum from my favorite Velvet Underground drummer. A double LP of bleeps, bloops, static and hum from my favorite Chicago drone gang. This was a really memorable show, visiting South America for the first time, playing with some of the best bands in Chile, or anywhere: Föllakzoid, The Holydrug Couple, La Hell Gang. The best museum exhibit of the year for me. Turned me on to Heinz Mack. The best new music book I’ve read this year. Not on the same level as Miles by Miles Davis, but a thoroughly enjoyable and frank memoir for Herbie fans. I missed the exhibit but this catalogue is a real treasure. Full-color reproductions of every page of every issue of Wallace Berman’s hand printed, mail-art magazine, Semina. I love Wallace Berman. I couldn’t decide between these two films. They’re so different, yet somehow push all the right buttons for me. Feel pretty lucky to be living in Oregon right now. Can’t wait for July.